The Information & Museum Studies Conference is an annual event that engages students, faculty, alumni, and professionals in the field of information and museums. It provides a platform for students to share and discuss their academic or professional projects with a broad community of peers. 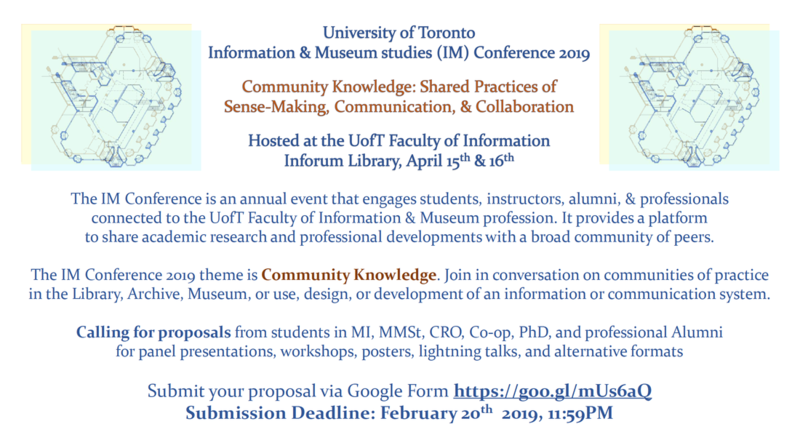 The IM Conference 2019 theme is Community Knowledge: Shared Practices of Sense-Making, Communication, & Collaboration. What does shared-knowledge look like in a community of practice; in the gallery, library, archive, ,useum, or use design, or development of an information/communication system? Calling for proposals for presentations, posters, and alternative formats !